Major Fred R. Clifton, Sr. Celebrating the life of Major Fred R. Clifton, Sr.
Be the first to share your favorite memory, photo or story of Major Fred. This memorial page is dedicated for family, friends and future generations to celebrate the life of their loved one. 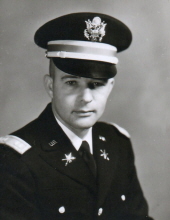 Obituary for Major Fred R. Clifton, Sr. Retired Army Major Fred R. Clifton Sr., age 82 went home to be with his Lord and Savior on Thursday February 7, 2019 after several years of declining health. Major Clifton proudly served in the United States Army for 26 years. He served in multiple roles while in the Army including Instructor of Air Defense Artillery. During his career he was stationed in Germany 2 times, Fort Bliss Texas in El Paso 3 times and in Santa Fe, New Mexico. Major Clifton was also stationed in Korea for one year and served one tour of duty in South Vietnam during the Vietnam War. His awards include the National Defense Medal, Vietnam Service Medal, Army Commendation Medal, Meritorious Service Medal, Vietnamese Cross of Gallantry and the Bronze Star Medal. Major Clifton was a dedicated and patriotic soldier. Major Clifton completed the Institute of Biblical Studies and was licensed to preach. He often preached at local churches and taught adult Sunday school. He was inducted into the Pittsylvania County Sports Hall of Fame in 2014 in recognition of his volunteer service to the Pittsylvania County Youth Sports programs. He loved to coach football and is lovingly known as “Coach” to the former players of the Brosville Bulldogs. As an avid hobbyist with a love for aviation and railroads, he loved building and flying model aircraft and was active in the Danville Model Railroad Club. He also had a passion for classic cars, especially Ford Thunderbirds, one of which he restored in blazing red sits proudly in his garage. He is survived by his wife of 62 years, Dixie L. Clifton. He is also survived by two sons, retired Air Force Lt. Colonel Fred R. Clifton Jr. of Las Vegas, Nevada and Steven Clifton of Denver, Colorado. He had five granddaughters that he loved dearly, Fallon Martinez, Talor Clifton, Cayla Fadely, Chloe Clifton and Cara Rose Clifton. Major Clifton will be missed. He was a respected member in his community. He was a loyal husband, father, grandfather and loving man. A memorial service will be held 3:00 p.m., Sunday, February 10, 2019 at Faith Memorial Baptist Church, 7450 Martinsville Hwy., Danville, VA 24541 with Rev. Daniel Lackey and Rev. Cleon Ross officiating. The family will receive friends 1:30 p.m. till 2:30 p.m., Sunday, February 10, 2019 prior to the service at Faith Memorial Baptist Church. Norris Funeral Services, Inc. and Crematory, West End Chapel, 511 Church Ave. Danville is serving the Clifton family. Online condolences may be made at www.norrisfuneral.com. To send flowers or a remembrance gift to the family of Major Fred R. Clifton, Sr., please visit our Tribute Store. "Email Address" would like to share the life celebration of Major Fred R. Clifton, Sr.. Click on the "link" to go to share a favorite memory or leave a condolence message for the family.